Please check back soon. Parker's selection sheet generally is available by midnight the day before the races on weekends and holidays, and by 11:30 a.m. race day for weeknight cards. No subscription necessary for single-copy purchases. Click here for details. Get the best value on Parker's and use your prepurchased selection sheets whenever you wish. View pricing/subscription info. For a limited time, get our lowest price on Parker's. View pricing/subscription info. Published by John Lindley, Parker's selection sheet has been sold at Longacres and Emerald Downs since 1985. 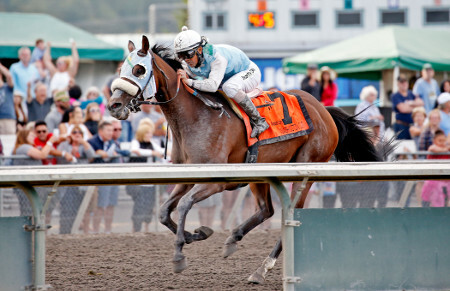 Parker's includes detailed analysis and wagers for every Emerald Downs race, exotic plays, each day's best bet and top longshot, and quick picks for up to three of the top tracks simulcast to Emerald Downs and state off-track outlets. John Lindley is a horseplayer, racing stable owner, author and on-air personality focusing on Emerald Downs in Auburn, Washington, where he's been based since its opening in 1996. John writes the weekly Race Notes for EmeraldDowns.com, featuring detailed trip and trouble notes on every runner. He frequently contributes his analysis to "Emerald Downs Live," which airs on Comcast SportsNet, and on Joe Withee's "Win, Place Show" on KJR 950-AM sports radio. He's the author of "Handicapping for Bettor or Worse" and contributed to "The Blood-Horse Authoritative Guide to Betting Thoroughbreds." • Learn more about John.